Nashville singer, songwriter Bri Murphy testifies on Capitol Hill Mar. 19, 2019. Murphy went on to tell the panel that during her eight years working music gigs in Nashville she has been grabbed, chased, blackmailed, drugged, stalked, catcalled, threatened and raped on the job. 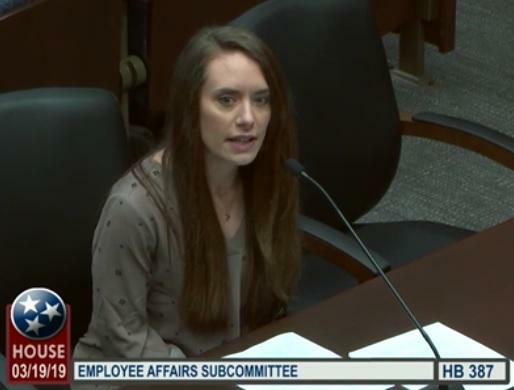 The committee’s Republican majority expressed sympathy and a willingness to act, but worried that passing the measure might blur the legal definition that separates contract workers from full time employees. Here is what Lebanon Republican Clark Boyd had to say during debate. Boyd suggested that the Chamber of Commerce, Music Industry Reps, Small Business advocates, and government agencies need to be involved in crafting what he would consider a workable bill. The measure was sent to a summer study committee. That's usually an indication the bill is dead for the session. Use the link below to hear the full committee debate on House Bill0387.